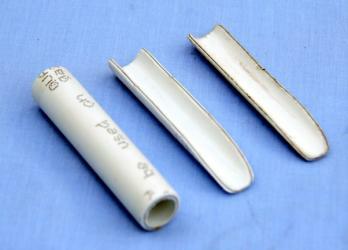 A guide to making tubes from simple household materials that can produce vowel-like sounds. The Background: how are vowel sounds made by people? 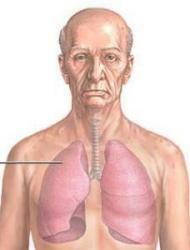 Role of the lungs, larynx and mouth. Making a Vowel Resonator: detailed instructions for building resonators for three different vowels. Making a Reed: detailed instructions for making a suitable sound source for the resonators. The Physics: some physical concepts underlying the acoustics of vowel production. Next we start to blow air from the lungs to force it between the vocal folds. The folds are blown apart and air rushes between them. But the vocal folds are still being pressed together, and they bounce back cutting off the flow. But this in turn allows them to be pushed apart again, and the cycle repeats. The result is that the folds open and close a few hundred times per second, chopping up the air flow into short pulses. This creates a buzzing sound that is called "voice". 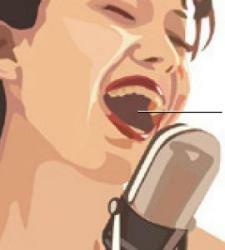 It is the primary source of sound used to make vowels. You can see a slow-motion film of vocal fold vibration. 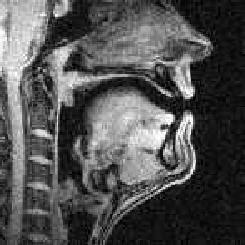 Voice is generated at the larynx, but for that sound to get out of the speaker, so that we can hear it, it must pass up from the larynx through the throat and mouth and out of the lips. It is at this point that one buzzing sound is changed into different vowel sounds. As the sound passes through the tube that connects larynx and lips, it changes in quality. 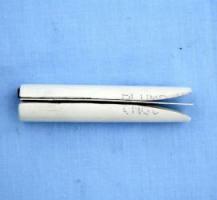 Furthermore that change in quality varies according to the shape of the tube. 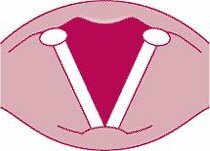 For an "AH" sound, we lower the jaw, open the lips and pull the tongue down and back in the mouth. 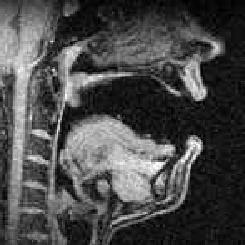 This makes the sound travel first through a narrow pipe just above the larynx, then into a larger pipe extending from the back of the mouth to the lips. This shape of pipe will change voice buzz into a sound that we recognise as "AH". We'll see later how we can make an artifical tube which makes a similar sound. If the jaw and tongue and lips are positioned differently, then voice buzz is changed in quality in a different manner, so that different vowel sounds can be made. We'll try this too. 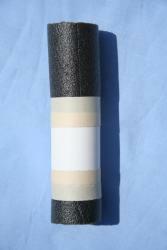 The key parts of the vowel resonators are made from plastic pipe and foam sleeving which are available cheaply from any DIY store. 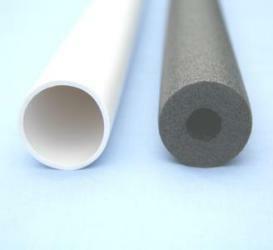 Lightweight plastic pipe of 1½ inches (40mm) in diameter is sold for waste output from baths and showers. It comes in lengths of about 2m, which is sufficient to make about 20 resonators. 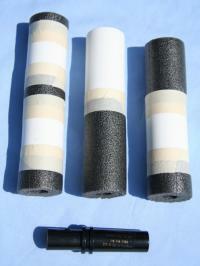 Foam sleeving is sold for the insulation of copper pipe used to carry water. Fortuitously, the insulation sold for covering 15mm copper pipe has an external diameter of 40mm, matching the diameter of the plastic waste pipe. 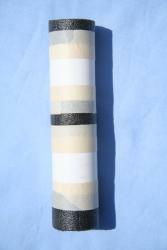 It comes in packs of 5×1m, which is sufficient to make about 50 resonators. You will need a way of cutting the plastic pipe to length. 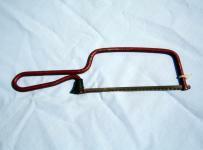 Professional plastic pipe cutters can be purchased, but the pipe can be cut quite easily with a small hacksaw. 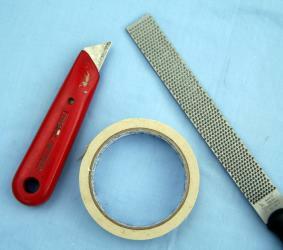 The foam sleeving can be cut with a bread knife or a small hacksaw. 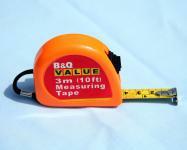 You will need a tape measure to measure lengths, and some tape to attach everything together. This resonator sounds like the long /A/ vowel that you find in words like "palm". 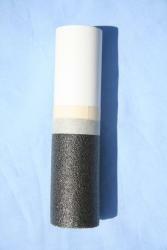 You will need 9cm length of the foam sleeving and 8cm length of pipe. 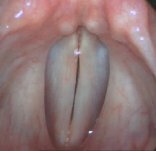 The narrow part of the resonator is analogous to the narrow part of the vocal tract from larynx to the back of the mouth, while the wide part of the resonator is analogous to the oral cavity. Example sound output using duck-call source. Click for detailed acoustic analysis. This resonator sounds like the short /I/ sound that you find in words like "bit". You will need 3cm and 7cm lengths of foam sleeving, and 6cm of pipe. 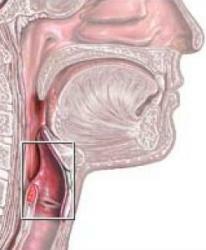 The 3cm narrow section is analogous to the narrow part of the vocal tract immediately above the larynx. 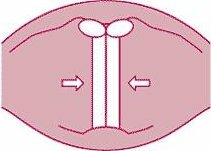 The 6cm wide section is analogous to the wide cavity behind the tongue, while the 7cm narrow section is analogous to the narrow section above the front of the tongue. This resonator sounds like the long /u/ sound that you find in words like "boot". 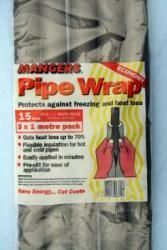 You will need 3cm, 3cm and 2cm lengths of sleeving, and two 5cm lengths of pipe. 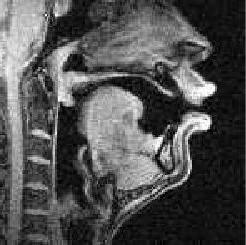 The first 3cm narrow section is analogous to the narrow part of the vocal tract above the larynx, while the first 5cm wide part is analogous to the cavity behind the tongue. The second 3cm narrow region is analogous to the narrowing above the tongue hump at the back of the mouth, while the second 5cm section is analogous to the larger cavity above the front of the tongue. The final 2cm narrow region represents the narrowing at the lips. The best type of sound source to use to excite the resonators is a duck call. 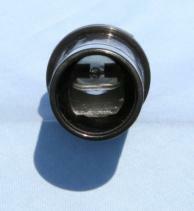 These are typically short plastic tubes about 15mm in diameter and 75mm long which contain a reed. When blown, they produce a low-pitched "quacking" noise. They are obtainable from shops which supply hunting accessories. This one is a Haydel's Double Reed Duck Call, which was purchased from Whistling Wings Ltd. However, if you have some workshop skills, it is easy to make your own. 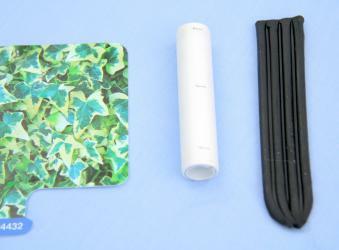 You will need some 15mm plastic pipe (15mm plastic water pipe is ideal), a thin sheet of plastic and some plasticine. 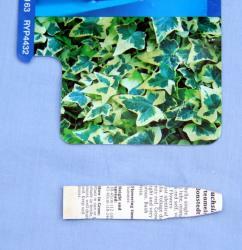 The thin sheet of plastic needs to be fairly flexible - I have found that the kind used for printed plant labels in garden centres is good. Really it should be no thicker than about 0.5mm. If it is too thick or stiff, it will not vibrate. You will need a craft knife to cut the plastic sheet. 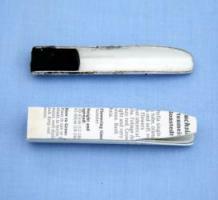 The pipe can be cut with the knife, a hacksaw or a pipe-cutter. 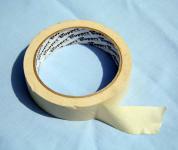 You will also need a wood file to smooth edges, and some tape to join everything. Cut a length of the 15mm plastic pipe about 7cm long. The finished reed needs to be long enough to be pushed 3cm into the resonator, while leaving enough to get your lips around. Cut the pipe into two along its length, to give you two semi-circular channels. 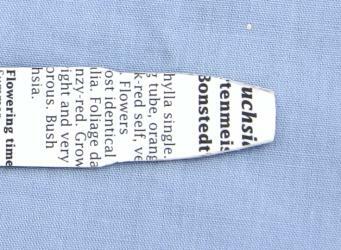 Now using the craft knife and the file carefully shape one end of both channels so that it smoothly curves away into a broad point. Using one of the channels as a guide, cut out a piece of plastic so that it has the same length and width as the pipe. 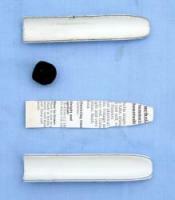 Then shape the last 2cm of the plastic into a tongue that is free to move within the internal diameter of the pipe. 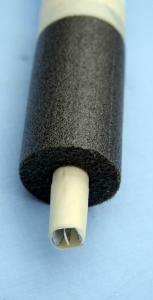 This entails rounding the sides within 2cm of one end, and also removing about 1mm of plastic at the edges. You are now ready to assemble the reed. First pack the plain end of the upper channel with a small amount of plasticine to prevent air passing along the upper channel. Then sandwich the plastic tongue between the channels, ensuring that the last 2cm is free to move within the curved end. Now tape all together. Add extra tape so that the reed makes a snug fit into the narrow end of the resonators. Ideally the reed should vibrate with a relatively low-pitch to make a convincing vowel. A fundamental frequency of about 125-150Hz is ideal. This is about the same pitch as the "C" below "middle-C" on the piano. You can adjust the pitch by changing the length of the tongue on the reed. A longer tongue will vibrate at a lower fundamental frequency. You will also need to adjust the shaping of the channels to allow it to vibrate. This is what it sounds like! The acoustics of vowels are well explained by the source-filter model of vowel production. In this model, a source creates a sound which then passes through a system which modifies the sound quality. Changes in the loudness and pitch of the sound are set by properties of the source, while modifications to the timbre, or quality, of the sound is performed by the filter. The waveform shape that comes out of the system has an interesting shape. The fact that the shape repeats is due to the fact that the input signal was a set of repeating pulses. The repetition period of the input is the same as the repetition period of the output (this has to be true: where would the pulses go to if the period were different?). The number of repetitions per second is the repetition or fundamental frequency. It is this frequency which sets the pitch of the sound. However, each repetition period of the output waveform has taken on a shape which is different to the shape in the input signal. This is caused by the effect of the system (filter) on the input. Here we can see that the mass-on-a-spring has vibrated for a short while at its preferred frequency of vibration, but that vibration has died away quite quickly. The difference in the waveform shape between input and output leads to a difference in the perceived quality of the sound, its timbre. The output signal has the same pitch but a different timbre to the input signal. A mass-on-a-spring system is a simple resonator. Such a system has only one preferred frequency of vibration. To draw an analogy between this system and our vowel resonators, you have to imagine a system with more than one preferred frequency of vibration. One way to do this is to imagine a second mass on a spring hanging from the first, and a third one hanging from the second. The output signal will now be the sum of the vibrations coming from the three resonating parts. Acoustic tubes like our vowel resonators, have multiple resonances: multiple preferred frequency of vibration. For acoustic tubes, these resonances are given the name formants. For vowels it is the frequency of the two lowest formants which defines the quality of the vowel. In designing these resonators, I have tried to find pipe lengths which would give resonant frequencies which match the formant frequencies of a human vocal tract when saying particular vowels. This is a rather approximate procedure, but the table below shows how well the pipes above match my own vowels. The "theoretical" values in the table above come from a calculation which makes a number of simplifying assumptions about the acoustics of the pipes used in the models. Nevertheless, the agreement is quite good.